Discover the power of liquid Envy with new Pure Color Envy Paint-On Liquid LipColor – the ultimate collection of ultra-saturated liquefied lip color in three bold finishes. Make a statement in liquefied matte pigments that define style. Demand attention with daring metallics that wrap lips in high-impact chromatic shine. Radiate confidence in a luscious wet vinyl polish. Painted in liquid envy, each shade and finish transforms lips into an irresistible, color intense work of art. 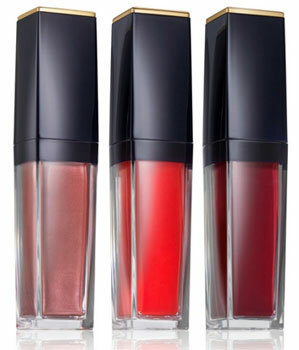 The triple threat of liquid lip color – Pure Color Envy Paint-On Liquid LipColor is color rich and ultra-comfortable. Featuring a Time Release Encapsulated Hyaluronic Acid, this high-performance liquid potion paints on perfectly sculpted, flawlessly fresh and silky-smooth lips in one stroke. Concentrated liquid pigments provide ultra-bold, color-true hues available in three captivating finishes. The curated collection of lip-sculpting liquids drenches lips in modern, vibrant shades ranging from chic neutrals to rich hues. A splash of matte attitude. Pure Color Envy Liquid Matte Paint-On Liquid LipColor delivers a full coverage matte finish in a weightless longwearing liquid formula. Color-rich liquefied pigments deliver an intense shot of matte color for depth, dimension and definition in one smooth stroke that doesn't budge and wears effortlessly for 8 hours. Daring metallic color destined to be envied. Pure Color Envy Liquid Metallic Paint-On Liquid LipColor wraps lips in full-impact, non-drying dimensional color and shine for uncompromised intensity. Infused with small and large particle pearls, the metallic chrome finish reflects light from every angle. Smooth and saturated, the liquid chrome formula provides instant hydration, gliding onto lips with precise application for a lasting color payoff that leaves lips feeling luxurious. The next dimension of vinyl shine. Pure Color Envy Liquid Vinyl Paint-On Liquid LipColor coats lips with bold, vibrant color and high lacquered shine for long-lasting high impact. The lightweight gellified fluid glides on precisely for immediate luscious moisture. Each glistening full-bodied shade works with the natural silhouette of lips for enhanced dimension. Lips look fuller and are lacquered in a sultry wet vinyl sheen that stuns. Pure Color Envy Paint-On Liquid LipColor is dermatologist-tested and suitable for all skin types. All items sold separately. Suggested retail pricing.